Taking place in January, Amazigh New Year, or Idd n Yennayer, is an ancient Berber celebration marking the first day of the agrarian calendar. The Berbers are an ethnic group indigenous to North Africa, especially Algeria and Morocco. Berbers celebrate Yennayer by gathering to share delicious home-cooked meals, including irkmen (wheat with dry fava beans simmered in soup) and tagola (corn with ghee), but the most classic dish is couscous with seven vegetables. 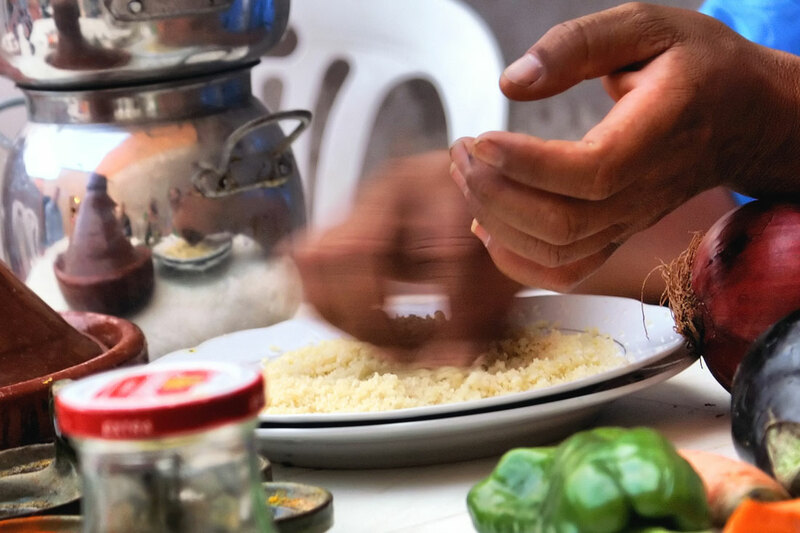 While couscous is a staple of the daily Moroccan diet, extra care is taken to prepare it during Yennayer. Many families will add a single date or almond to the dish – anyone who finds it is considered blessed for the year. Here, Redouane El Moutasim, the man behind Peregrine’s Gourmet Explorer Morocco trip (and a Berber himself), reveals a classic Yennayer recipe: hand-rolled couscous with lamb and seven vegetables. The day before cooking, soak the chickpeas in water. The next day, drain and peel them. Mix the lamb together with the onions, tomatoes, spices and a small amount of oil in a pot. Traditionally, this dish is prepared in a tagine or earthenware pot, but if you don’t have one, just use a casserole dish instead. Cook for about 15 minutes over a medium heat until the meat starts to brown. Add 500mls water, parsley and the chickpeas. Cook for 20-30 minutes. Moroccan couscous is always steamed, not boiled, giving it its fluffy texture. It’s a repetitive task – steaming, cooling and rubbing with oil three times – but it’s well worth it! While the meat is cooking, bring the dry couscous to steam. You’ll need a steamer basket for this part. Put the dry couscous into a large bowl. Douse your hands in vegetable oil and rub it through the couscous. Stir in 6 cups of water, then drain the couscous in a fine sieve. Transfer the couscous to the steamer basket (it’s a good idea to oil this beforehand, too). Steam for 15 minutes, then transfer the couscous back to the bowl. Leave to cool. When cool, add a teaspoon of salt, douse your hands in water and gently rub the couscous as before. Put the couscous back in the steamer. Steam for another 15 minutes. Meanwhile, add the carrots and turnip to the pot. Once steamed, transfer the couscous back to the bowl. Allow to cool, and taste, adding more salt if required. Rub a small amount of water through the grain and return to the steamer for 15 or 20 minutes. Meanwhile, add the pumpkin, zucchini and sweet potato to the meat pot. Stir and cook for 15 minutes or until cooked through. Transfer the couscous into a serving bowl and use your hands to separate the grains. You can add some butter here if you’d like to. Make a space in the middle of the bowl and add the meat. Arrange the vegetables around the rest of the dish, then pour the sauce on top (and leave a little extra to be added later). Feature image c/o Diana K, Flickr. Sound delicious? Eat your body weight in couscous on our Gourmet Explorer Morocco trip.